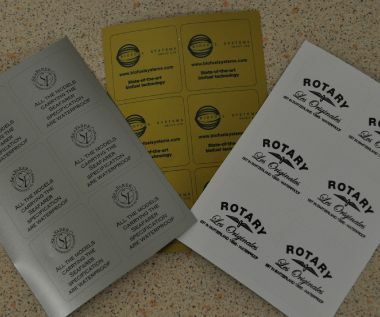 Self-Adhesive vinyl industrial identification labels, measuring 50mm x 50mm. ideally suited for interior or exterior use. Our low cost identification labels are pre-cut with rounded corners and supplied in sheet format. They are ideal for adding company details to equipment. Printed in spot or full colour which can incorporate your own logo and company details, supplied in numerous finishes and with a self-adhesive backing.